As one of Nityananda Prabhu’s closest confidantes, Uddharan Datta Ṭhākura is called parama-parama-patita-pāvana, “the deliverer of the most fallen amongst the most fallen”. Thus, any jiva who takes shelter of Uddharan Datta Ṭhākura is quickly delivered from his material entanglements and attains the service of Nityananda Prabhu and Gauranga Prabhu’s lotus feet. Uddharan Datta was the best of the Bhagavatas, who served Nityananda Prabhu’s lotus feet in every way possible. The cowherd named Subahu became Uddharan Datta. Nityananda Prabhu remained a few days in Khardaha and then went on to Saptagram with his troupe of associates. The Lord stayed at the home of the fortunate Uddharan Datta on the banks of the Triveṇī. Completely surrendered to the feet of Nityananda Prabhu, Uddharan Datta worshiped Him without any false pretense. The entire caste of gold merchants was purified by the presence of Uddharan Datta in its midst, of this there can be no doubt. In order to show that one’s caste and family background are completely irrelevent, Hari Das Ṭhākura took birth in an outcaste family. Śrī Krishna Chaitanya and Nityananda Prabhu wanted to teach that a great devotee may appear in any family or in any caste, and so They had some of Their devotees take birth in such households. One who takes birth in a low-class family is not disqualified from performing devotional service, nor is one who born in a pure, high-class brahminical family automatically qualified for such service. Whoever engages in the worship of the Lord is a great person; one who does not worship is rejected. Anyone who considers the deity to be nothing but stone, the guru to be an ordinary human being, or the Vaiṣṇava to be a member of a particular caste or race, who takes the holy water which has washed Viṣṇu or the Vaiṣṇava’s feet and can destroy all the sins of the age of Kali, to be ordinary water, who thinks that the name or mantra of Viṣṇu, which destroys all evils, is the same as any other sound, or who takes Viṣṇu to be equal to anything other than Him, is a resident of hell. Anyone who sees a Vaiṣṇava in terms of his material birth is destined for a hellish existence. Subahu took birth in a family of gold merchants, but this does not mean that he was a gold merchant — he was an eternal associate of the Lord beyond the material qualities. One cannot understand the underlying nature or ontological aspect of the Lord and His devotees by using the gross or subtle material senses; one can only get a superficial understanding of their morphological or external aspect. The true nature of the devotee and the Supreme Lord is revealed to the surrendered heart. If Uddharan Datta Ṭhākura is merciful, one can understand his transcendental nature and his divine glories. Amongst devatas, Viṣṇu is supreme. Only by uttering the name of Viṣṇu can all of one’s sins be burned up, all inauspiciousness in one’s destiny be destroyed and auspiciousness gained. A single utterance of the name of Rama equals a thousand repetitions of the name of Viṣṇu. Oh! sweet-faced Durga, I take great pleasure in chanting the names of Rama, Rama, Rama. Even though the name of Krishna and the Krishna-mantra are supremely powerful, offenses are taken into consideration in the chanting of Krishna’s name. Even the glow of the Holy Name (nāmābhāsa) can destroy all sins and give one liberation. Nevertheless, if one commits offenses, the benefits of nāmābhāsa are lost. Lord Krishna withholds His mercy from the offensive person. The difference between a sin (pāpa) and an offense (aparādha) is the following: an improper act committed toward a conditioned embodied being is a sin, whereas a similar improper act committed toward Viṣṇu or the Vaiṣṇava is an offense. An offense has more grave consequences than a sin. Ajamila was a great sinner, but because he had committed no offenses, he was delivered by the power of nāmābhāsa. Lord Śrī Chaitanya Mahāprabhu and Nityananda Prabhu delivered everyone, both sinners and offenders. 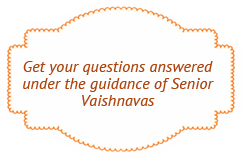 There are offenses to be considered while chanting Krishna’s name. Therefore, simply by chanting His name, the offender does not become ecstatic. But these considerations do not exist where Lord Chaitanya and Nityananda Prabhu are concerned. So as soon as one chants the name, he feels the ecstasy of love for God. Nityananda Prabhu is the avatāra of mercy; He is so intoxicated by ecstatic love that He does not discriminate between the good and the bad. He delivers anyone who falls down before Him. Therefore, He has delivered such a sinful and fallen person as me. Śrīla Vrindavan Das Ṭhākura has particularly given extensive glorifications of Nityananda Prabhu. The sinful and offensive living beings of this world have no alternative but the mercy of Nityananda Prabhu if they want to be delivered. Even though Nityananda Prabhu is bhagavat-tattva, He behaves as a devotee. All of His associates are expansions of His mercy. Nityananda Prabhu is said to be the deliverer of the most fallen; His companions seek out even more fallen souls to deliver. In fact, Nityananda Prabhu distributes His mercy to the conditioned souls through his devotees. From a superficial point of view, Uddharan Datta worked as the manager of a big zamindar (Nairaja) of Naihati. The relics of this wealthy family are still visible not far from the Dain Hat station. The village where Uddharan Datta Ṭhākura lived while acting as the manager of the estate was named Uddharan pura. Though he possessed a vast fortune, Uddharan Datta renounced all sense gratifications, dedicating all of his sense activities to the service of Nityananda Prabhu. Being controlled by the love of His devotee, Nityananda Prabhu enjoyed the foodstuffs that Uddharan had cooked. The Lord will grab food from His devotee, but He will not even glance at anything offered by a non-devotee. At Uddharan Datta’s Sripat in Saptagram, which stands on the banks of the Saraswati River, one can still see the six-armed form of Mahāprabhu that he personally worshiped. On the right side of Śrī Chaitanya Mahāprabhu is a deity of Śrī Nityananda Prabhu and on the left side is the deity of Śrī Gadadhar Pandit. On another altar are the deities of Radha Govinda and a Shalagram Shila, and below the throne is a picture of Śrī Uddharan Datta Ṭhākura. After Uddharan Datta disappeared, Jahnava Devi made an auspicious visit to his home. Śrīla Krishna Das Kaviraj Gosvāmī writes in the Chaitanya Charitamrita that his brother did not have as much faith in Nityananda Prabhu as he had in Chaitanya Mahāprabhu. This was the cause of an argument between his brother and Nityananda Prabhu’s follower Minaketana Rama Das. Śrīla Kaviraj Gosvāmī took Rama Das’ side in this argument and rebuked his brother. Nityananda Prabhu was pleased with Śrīla Kaviraj Gosvāmī just because he supported His devotee. Nityananda Prabhu gave him a vision of Himself, the right to live in Vrindavan and service to the lotus feet of Radha and Krishna. The conclusion is this that if we worship Uddharan Datta Ṭhākura, serving him and try to please him, we will quickly be able to get the mercy of Lord Nityananda Prabhu, through which we will become eligible to attain love for Krishna and thus perfect our lives. In order to attract people and thus bring their welfare to Uddharan Datta’s Sripat it is necessary to make repairs to the buildings on the site. Through this, people will become aware of his glories and will seek his mercy and become blessed. If one makes an effort to serve, the object of worship will give the commensurate power to serve. In front of the Saptagram temple, a large hall has been constructed, in front of which is a shady and cool terrace covered by a madhavi creeper. Srinivas Datta Thakur was Uddharan Datta’s son. Their descendants have spread into many branches and today live in Calcutta, Hooghly and many other places. Those who have taken birth in this family are doubtlessly very fortunate individuals. We pray that they abandon the superficial illusory family connection and establish their transcendental relation with him and take care of developing the birthsite of Sri Uddharan Datta Ṭhākura. Uddharan Datta Ṭhākura left this world in the Shaka year 1463 (1551 AD), on the kṛṣṇā trayodaśī of the month of Paush. Picture is of the personally installed worshiped deities of Sad-bhuja Mahaprabhu, Sri Nityananda Prabhu and Gadadhara Pandit by Uddharana Datta Thakur.